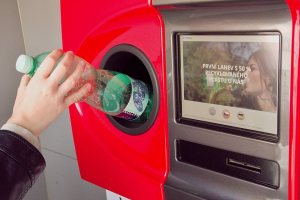 The initiative “Let´s back up!” in cooperation with the company Mattoni created new backed up PET bottles with 50 percent of recycled “rPET” material. The machines for returning these bottles were tested on Sunday October 7 during the Nature Run in Liberec. The automat for backed up plastic bottles is similar to classic automat for glass bottles. It is necessary to put into the machine empty and uncrumpled plastic bottles. After inserting the bottles automat will print you a receipt. After the submission of the receipt consumer will get new bottle full of mineral water. In Germany backed up plastic bottles are a standard. Although Czechs are one of the best in sorting waste in Europe backed up plastic bottles are news.